I’m attending my professor’s daughter wedding this weekend in Jogja. Back to the lovely city where I pursued my bachelor degree. It’s also a place where i and Elok shares lots of memories. One of them of course is food! 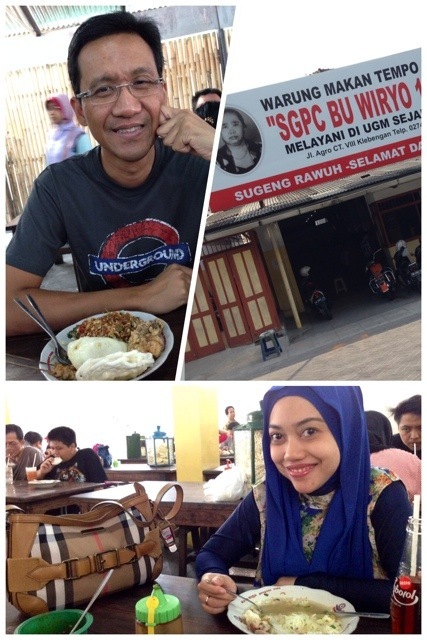 After took Soto Sholeh for lunch yesterday, and Sate Samirono for dinner, this morning we went to Sego Pecel (SGPC) Bu Wiryo. Established since 1959, this place is still popular in Jogja, especially among UGM students. I reckon this as best Sego Pecel in the world. The taste is authentic and the ambience is irreplaceable.